you know what i love? a pantry meal. that’s what i call the type of meal that needs no trips to the store, no fancy recipes, just a little creativity + using ingredients already in your house. the delicious pizza above was a pantry meal i whipped up a few days ago, for Week 15 of my One-New-Dinner-A-Week challenge. and people, it turned out so good – you’ve gotta try it! i had a sheet of puff pastry in the freezer that i wanted to use up, leftover tomatoes from this pasta salad, + pepperoni + mozzarella from making pizza a few weeks ago. seeing those ingredients, i got an idea – a puff pastry pizza! i rolled out the puff pastry, baked it ’til golden, popped on our favorite toppings, baked it for a few more minutes + voila – done + delicious! the puff pastry lends such a lovely, buttery flavor – it’s a wonderful twist on traditional pizza. one puff pastry sheet pizza makes just enough for a light dinner for two, so if you’re serving a crowd, double the recipe, or make a salad to accompany it. the one thing i can promise? everyone will love it – my husband + i were so impressed that such a quick, easy pantry meal turned out so incredibly tasty! serves 2, a fearless homemaker original! take the thawed puff pastry sheet + roll it out to a rectangle or oblong shape about 11” x 15”. using a fork, prick the entire puff pastry except for about a 1/4” strip around the outside edge. this outside edge will be the crust. bake for about 15-20 minutes, until the puff pastry is golden brown + slightly puffed. remove the baked crust from the oven. top the puff pastry crust with the marinara/pizza sauce, 1/4 teaspoon of italian seasoning (or more to taste), mozzarella cheese + any other toppings you choose (i used pepperoni + tomatoes). put the pizza back in the oven + bake for about 5 minutes until the cheese is melted. if you like your cheese slightly browned (like i do), turn up the oven to a low broil + broil for about 3 minutes, or until your cheese is perfectly browned. slice + serve! I couldn’t wait to see this after it was on IG yesterday. What a great idea, the pizza looks so good! What a great idea! 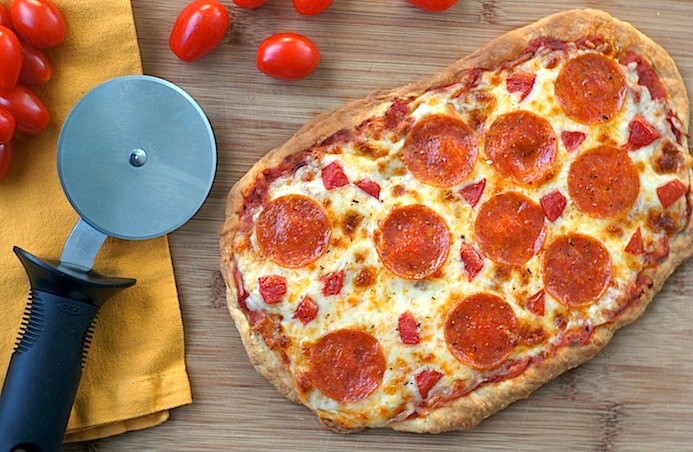 I never would have thought of using puff pastry for a pizza but it looks so delicious. Great idea! I seem to always have puff pastry floating around since I need it, then forget I have some and buy more! Man, this looks so good! After seeing this yesterday on IG, I definitely wanted some pizza. Plus side? It doesn’t look at all fatty like ordered pizza. I will definitely give this a try!! Yum! I’m with you, I love “pantry meals,” as well. I love not having to buy 20 ingredients at the store to make something!! And let’s be honest … who doesn’t love pizza??? This looks fantastic! I love that you used puff pastry. Looks like the perfect dinner. Thanks for sharing the recipe. I saw this pic the other day when you posted it and I drooled then and I’m drooling now. Because I adore pizza. And the fact that you made this just makes me adore you!!! You know what doesn’t go with this pizza? The best dishes come from pantry meals! Great idea using a pastry sheet – I’m sure the flaky buttery nice was incredible with the pizza toppings. brilliant! i never even thought of using puff pastry!!! just brilliant! this proves to show that imagination in the kitchen is key to success! Hehehe! Like most of the other commenters, I’m thrilled to now have some other way to use up my extra puff-pastry sheets (why does it seem like I always have one in the freezer??). This looks just gorgeous! AND, I’m totally drooling over your photos! Are you using Instagram for these, too? I’m probably the last person on the face of the planet to not yet own an i-phone. i always seem to have an extra sheet in my freezer, too! that’s just how puff pastry rolls. =) this picture is from my regular camera, but the one i posted on Facebook on tuesday night was from instagram. i only got an iPhone a few weeks ago, so you can’t be far behind! I love puff pastry! The next time I have some I’m going to make this. I thought about making some from scratch but that kind of defeats the purpose of the whole pantry meal thing. I just love that picture. I always want to take pictures of my pizzas but they come out exceptionally ugly so I can really appreciate the beauty in this one. genius! I never know what to do with puff pastry besides sweet things or small savory apps. great idea!! further proving that great minds think alike! This is too funny. I’ve made both pasta salad AND pizza this past week. Great minds think alike, no??? I love this idea of pantry meal…such a pretty name for what I call it (the, “I clearly have too much random stuff hanging out in my cabinets…let’s throw them all together and see what I come up with). yes, your term is MUCH, much better! I LOVE this idea and I love easy “pantry meals”!!! What a fun way to change up the normal pizza. I guess I now have a reason to keep puff pastries stocked in my freezer. This sounds great! I like the idea of using puff pastry on pizza – sounds delicious. I can’t believe I’ve never thought to use puff pastry. Gosh, I bet that tastes amazing. I mean, seriously you just cannot go wrong with cheese & puff pastry! I’m so making this for Jeff & I next week. What a quick & easy week night meal tip – thanks Amy! What a fun idea, I bet that crust was great for a pizza. this is such a great idea. Would have never thought of that. Sometimes i stand in my kitchen and stare at ingredients in my pantry that i need to use up…and stare…and stare. Then usually end up closing the door. LOL. Genius I tell you…genius. Definitely going to try this idea. Looks so delicious. i’ve definitely be there, staring in the fridge/pantry for minutes, hoping something will jump out at me. =) i love it when something delicious actually comes out of it! This is a great idea and it looks so good. You know I love anything pie crust or puff pastry. I have some in freezer and I have mozzarella and I’m getting excited thinking about it. I love those pantry meals. Your creative juices bring it. Oh this is such a fantastic idea Amy! Absolutely perfect to put together last minute. I have been making my own dough for awhile now but this sounds like a perfect alternative for when I am short on time. Super tasty idea, thanks hun! It’s a great idea to use puff pastry to make pizza. Love it. It looks so yummy! Some of the best dishes come about from simply being forced to use the ingredients on hand. Looks great Amy! A pantry meal is a clever meal, and the puff pastry turned into a nice pizza is just delicious! I love pantry meals too. It’s such a nice feeling to be created with what you have on hand. Your pantry pizza looks delicious! Hey Amy, so smart! I love puff pastry, and don’t love the fridge pizza dough in a can. I don’t make pizza at home because I just can’t seem to make crust. BUT, puff pastry crust is teh yummo answer to my home pizza problem! I know I already commented, but I wanted to tell you I just bought a puff pastry pizza from Trader Joe’s. For the record, the store-bought pizza was good, but yours looks so much more delicious. You were definitely on to something here!